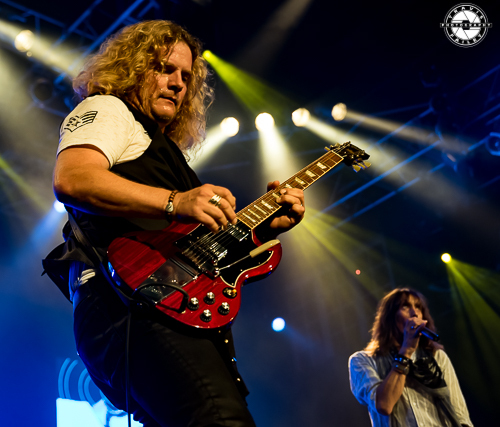 KNAC.COM - Reviews - TESLA, WEAPONS OF ANEW In Orlando, FL With Photos! 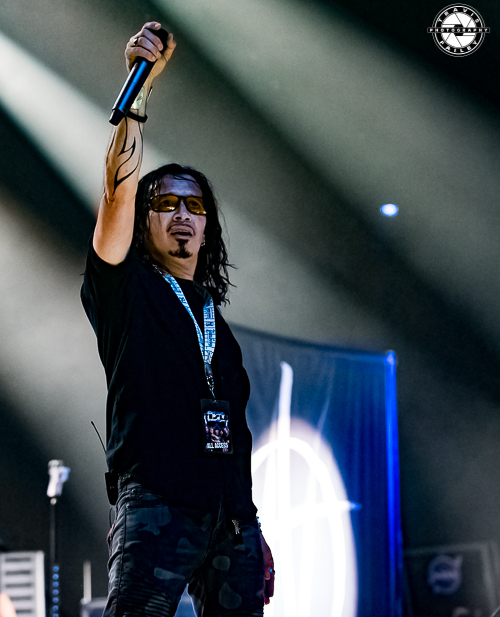 TESLA, WEAPONS OF ANEW, VOICES OF EXTREME In Orlando, FL With Photos! It was October 23rd 1987 and DEF LEPPARD was back in Chicago after a long hiatus between Pyromania and their new release, Hysteria, because their drummer, Rick Allen, tragically lost his arm in a car accident. 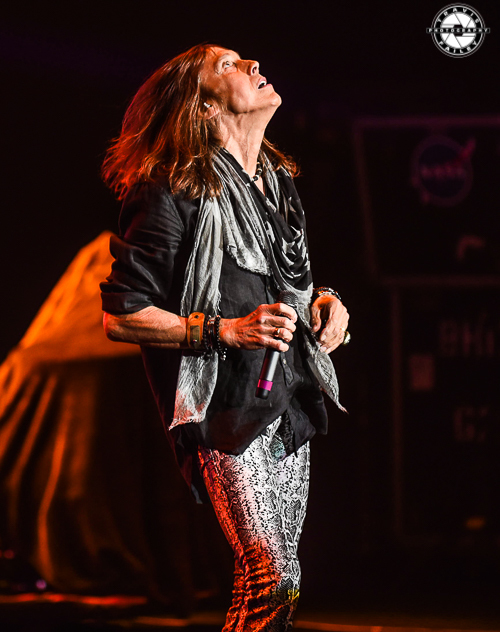 DEF LEPPARD's highly anticipated tour was the talk of the town. They were performing in a new format, "the round", and their single, "Women", was doing well, peaking at #7 on the Rock Charts. 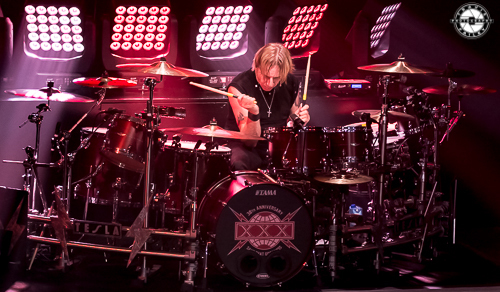 Another reason for the buzz was that DEF LEPPARD was bringing out a hot new band from Sacramento called TESLA. Previously known as CITY KIDD before changing their name due to legal reasons, TESLA was out supporting their debut album, Mechanical Resonance, that was released in December of 1986. MTV was playing the videos (yes, I said videos) for "Modern Day Cowboy" and "Little Suzi" in regular rotation. A little known fact is that "Little Suzi" was actually a cover song done originally by British New Wave Band PH.D in 1981. Check it out HERE. 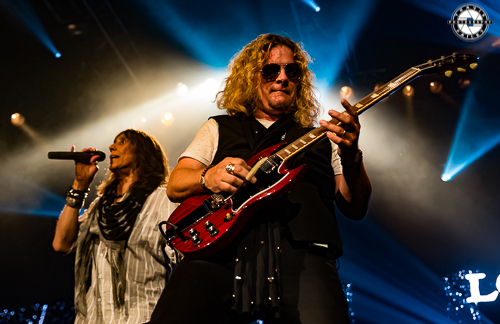 The house lights went down in the Rosemont Horizon and TESLA burst on to the stage with "Coming Atch Live" and stole the show from their veteran tour mates to kick-start their career. 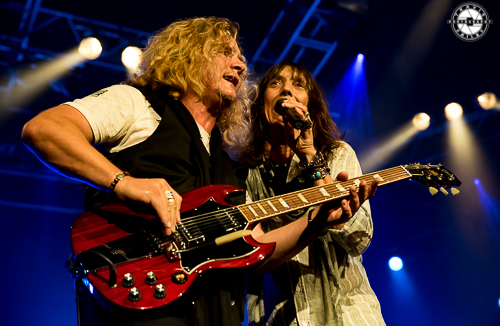 30 years later and millions of albums sold worldwide, TESLA brought their 30th Anniversary celebration to the House of Blues in Orlando on Saturday night. 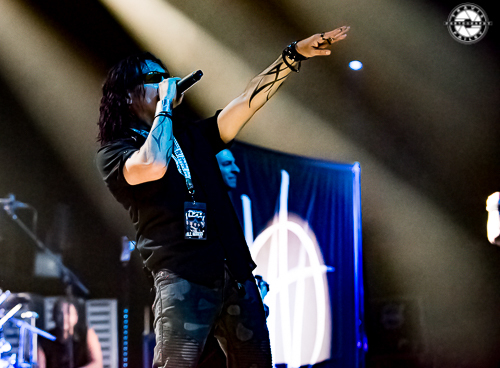 The sold-out show featured TESLA, WEAPONS OF ANEW and VOICE OF EXTREME. It was a rainy night, but even the side-ways rain and wind didn't keep the Generation Xers away. 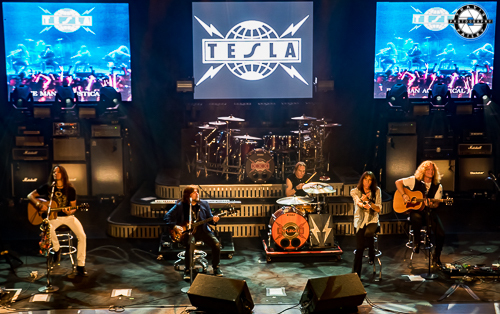 And it was all worth it because everyone that attended were treated to an amazing show by TESLA. 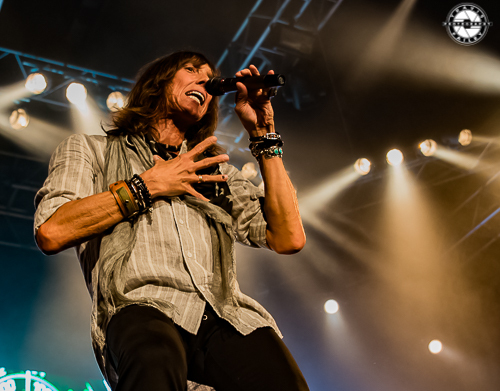 Vocalist Jeff Keith was spot-on all night, and put on a memorable performance at the House of Blues on Saturday night. Speaking of the House of Blues, that place was stupid crowded. I've been to a bunch of concerts throughout the years at that H.O.B., and this was hands down the biggest crowd that I've seen at that venue. The place was packed body-to-body, and if you didn't get there before the opening band, well, sorry about your luck. I hope that you like standing in stairways and behind poles. Nobody even moved toward the bar or the restrooms after each band's set. The first band up Saturday night was VOICES OF EXTREME, a/k/a VOX. 3 guys form this rock band from New York, but you'd never know it by the big sound that's provided by the back line. VOX is out promoting their 3rd album, Mach III, that came out in July 2017. VOX is made up of Don Chaffin (vocals and guitar)(only original member), Steven G. Knight (bassist) and Bobby Marks (drummer). 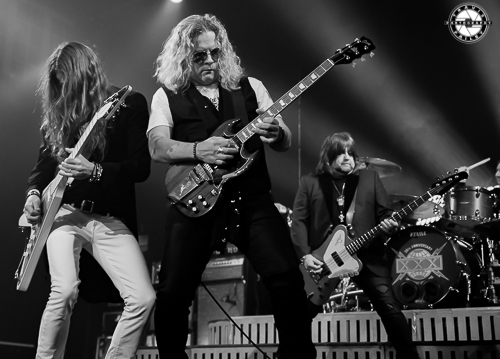 The band's been out touring with Dee Snyder recently, and they were definitely a great addition to Saturday's lineup. 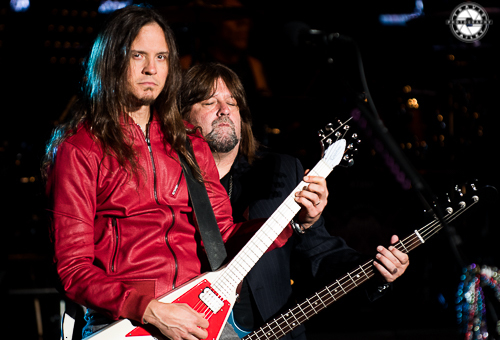 VOICES OF EXTREME's set included a cover of THE WHO's "Won't Get Fooled Again" and "Unbroken". THE WHO cover was done really well and got a positive response from the crowd. VOX was a perfect warm up band for TESLA. They are high quality musicians with a bombastic sound that seemed to go over well with the crowd. Next up was WEAPONS OF ANEW, which features SPREAD EAGLE vocalist Ray West fronting the five piece. WEAPONS OF ANEW is a classic metal band with a modern sound that seeps with aggressive tones and plenty of dual lead guitar pieces. Highlights from WEAPONS OF ANEW's set included their first single, "Killshot", and "Speed I Drive". I was very impressed with their set and with the overall tightness of the band. From the crowd's reaction, while I think WEAPONS OF ANEW may have gained a few new fans, it seemed that VOX went over better with this older crowd, being that WEAPONS OF ANEW may have been too heavy for a lot of the TESLA fans. But overall, I'd say that both VOX and WEAPONS OF ANEW are good reasons to go to the show early and see the opening acts. As the stage changeover was near completion, three black video screens displayed large white text that read "30 Tesla Years". 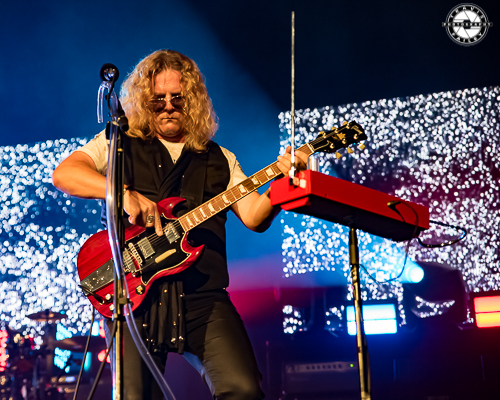 Throughout TESLA's set, videos and images of the band changed with each song, starting with the opener "MP3" from their last studio album Simplicity and then "Into the Now" from TESLA's 2002 album of the same name. I think that these two songs took some in the crowd by surprise. Unless you are a hard-core TESLA fan, you probably weren't familiar with these two tracks as you are with their hits that TESLA had from its first four releases. But by no means are these songs considered deep tracks, but some "older" bands like to fire up the crowd from the jump with a classic hit. This opening set choice had some fans turning their heads in wonder while others put their eyes down at their phones. Personally, I like seeing bands take chances with their set choices; throwing in a few surprises for their faithful. After opener "MP3" and "Into the Now", TESLA gave their fans exactly what they wanted. 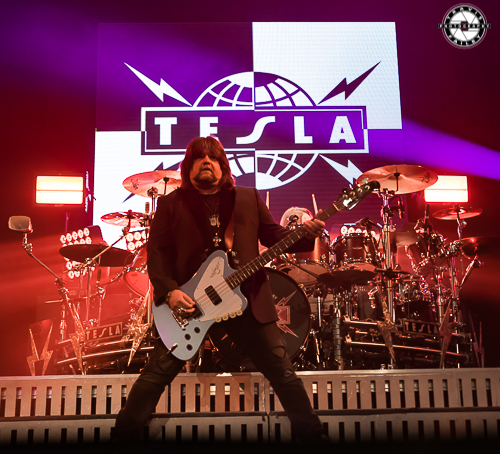 A trifecta of songs from TESLA's sophomore release, The Great Radio Controversy, gave the audience the opportunity to warm up their vocal chords and join in with Jeff Keith and the boys. 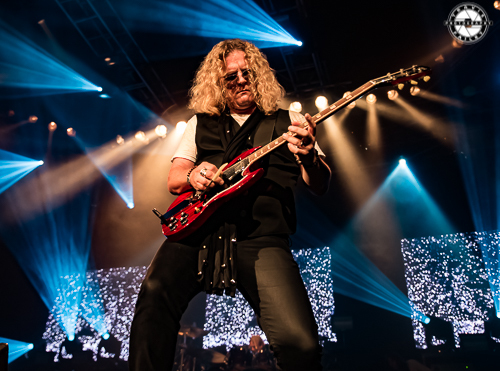 "What You Give", "Hang Tough", and "Heaven's Trail (No Way Out)", led to guitarist Frank Hannon addressing the crowd and thanking them for coming out. While this was happening, an array of acoustic instruments including a mini drum kit was brought on to the stage for Act 2 of TESLA's performance. A stripped down version of "Comin' Atcha Live" was the first song of their mini-acoustic set and it went over really well but its message comes across better when it's played fully electric. The original energy is lost a bit in this format. The other songs in Act 2 was a cover of THE GRATEFUL DEAD's "Truckin", and "Paradise", featuring bassist Brian Wheat on piano and drummer Troy Luccketta utilizing soft bass drumming mallets. Up next was a song that really sparked the crowd and arguably, the whole unplugged MTV movement in 1990, "Signs". That track by the FIVE MAN ELECTRIC BAND song helped introduce TESLA hit a whole new audience when they covered this song on their Five Man Acoustical Jam release. After "What You Give", Frank Hannon came to the forefront as TESLA kicked it back into gear with "Edison's Medicine" from Pyschotic Supper. Hannon got the theremin going. Some in the crowd were amazed with the odd tones and the manipulation of the notes without Hannon physically contacting the two metal antennas that extend out of it. Jimmy Page and Tracii Guns still use it to this day during their performances. 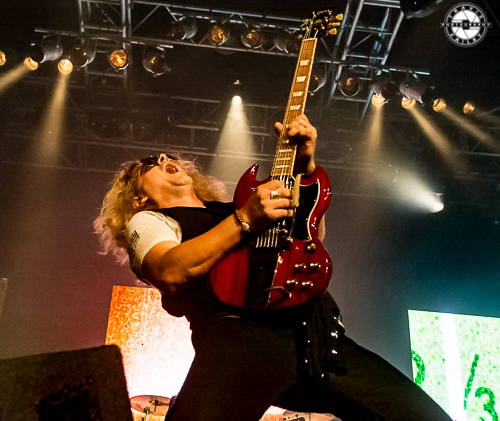 Hannon was on fire all night with his cherry red Gibson guitar. He is truly an underappreciated guitarist and song-writer. Keith and Hannon should be mentioned in the same conversation as the other great twosomes of the past. Just listen to TESLA's follow-up to Pyschotic Supper, Bust A Nut. Bust A Nut's a songwriting masterpiece that is criminally underrated. With the Disney's 11 o'clock curfew just around the bend, the crowd hoped that TESLA would play their biggest hit, "Love Song", and they didn't disappoint. 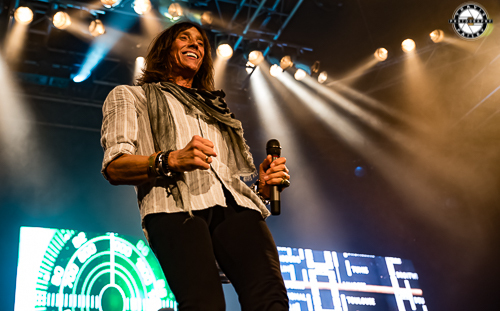 The chorus re-verberated off the walls of the House of Blues as everyone in attendance joined Jeff Keith from the song's start to finish. 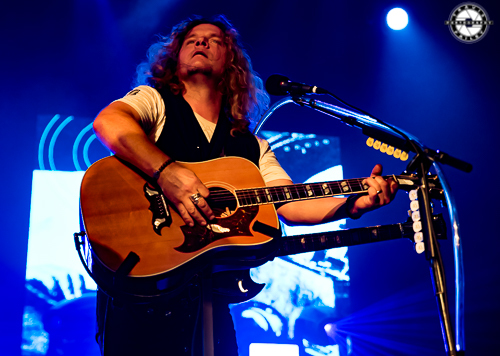 TESLA's "ballad" has a strong positive message that still resonates with people. There was a lot of PDA going on during that song. There wasn't a dedicated "encore" because TESLA didn't leave the stage to finish its set. 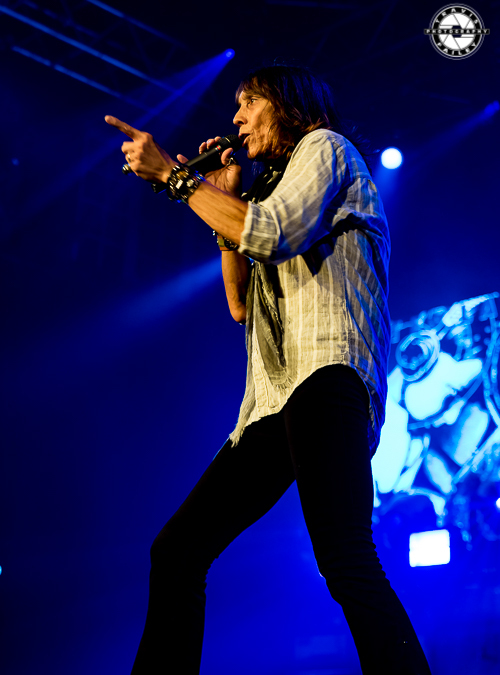 TESLA continued their extended set with "Little Suzi", which showcased Keith's vocals and specifically his screaming ability leading into the last chorus. Some of the women in the crowd bounced their assets like they were in the 80's, the only difference now was that they kept their shirts on. The gangster/cowboy track, "Modern Day Cowboy" concluded TESLA's set while the classic MTV video played on the big screens. As the lights came up and the crowd dissipated into Disney Springs, one thing was certain: great bands with great songs will create life-long fans. 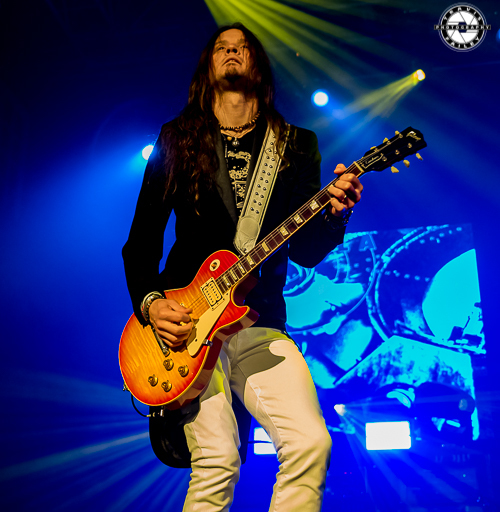 On Saturday night at the House Of Blues, TESLA proved this fact once again, as they have so many times in the past and will continue to do so in the future.